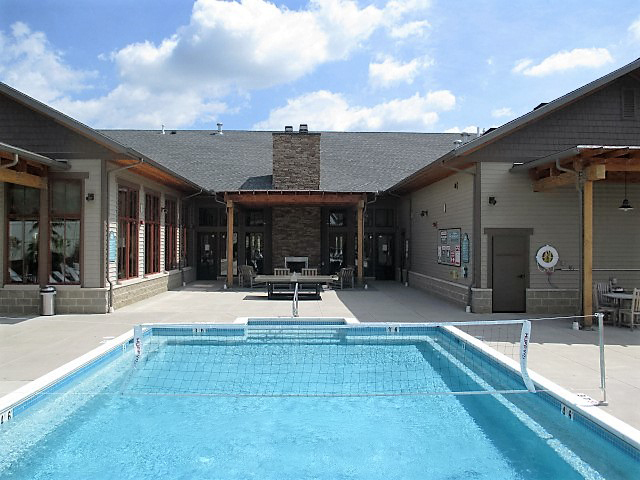 What is one of the best ways to upgrade the amenities at your apartment community? 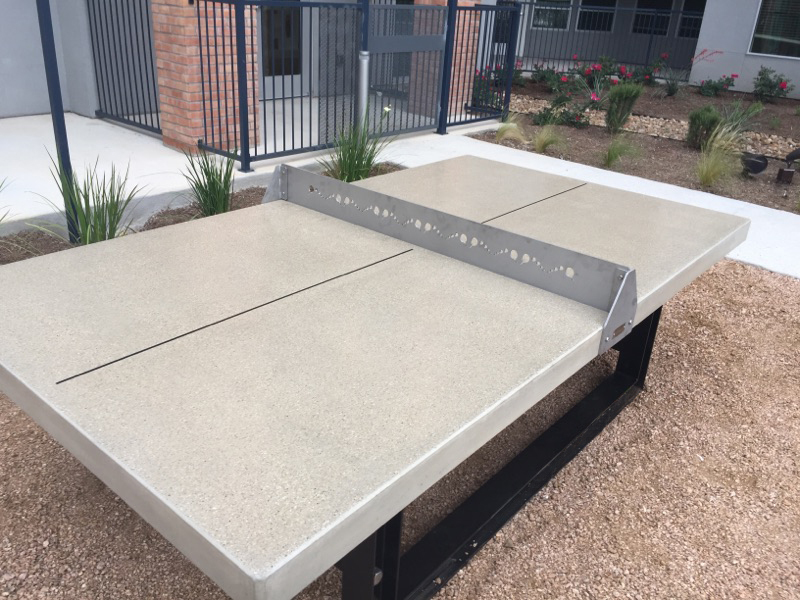 Why not add a Doty & Sons concrete outdoor ping pong/ tennis table to your outdoor recreation area? This table, Item T1086035, has a concrete top with a heavy-duty steel frame. The table makes a simple, but attractive addition to the outdoor community area of any residential complex. 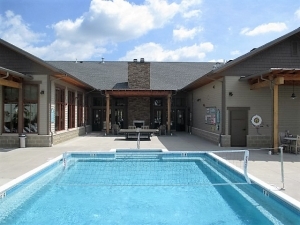 We have had a lot of interest in these tables from apartment developers and managers who want to attract residents by adding top-notch recreational amenities. 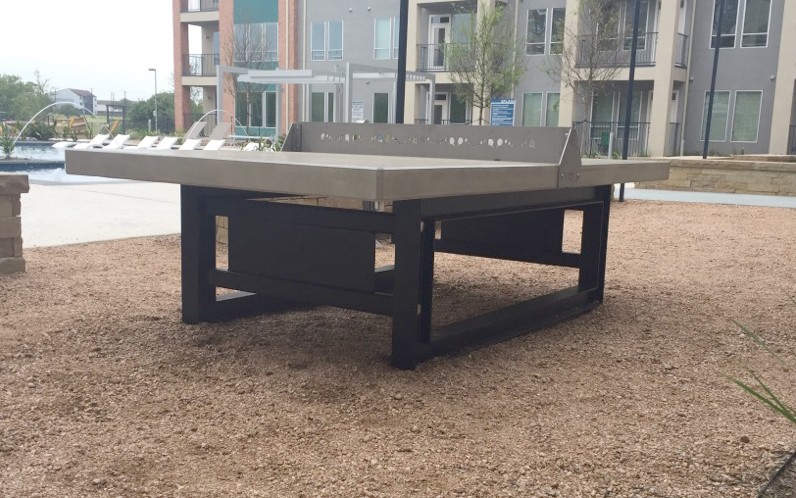 In April 2017, we sent 2 outdoor ping pong tables to the NRP Group who develop and manage upscale apartment complexes across the United States. We shipped tables to The Upton at Longhorn Quarry and The Kennedy at Brooks City Base, both located in San Antonio, TX. Close up view of the ping pong table showing the polished table top and stainless steel net. 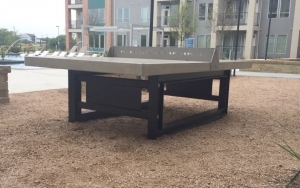 Outdoor Ping pong table at The Upton at Longhorn Quarry’s outdoor pool area. In May 2017, we sent a ping pong table for McKinney Properties, to State College, PA where it now sits poolside at The Heights at State College, a resort-like student apartment complex near the campus of Penn State University. 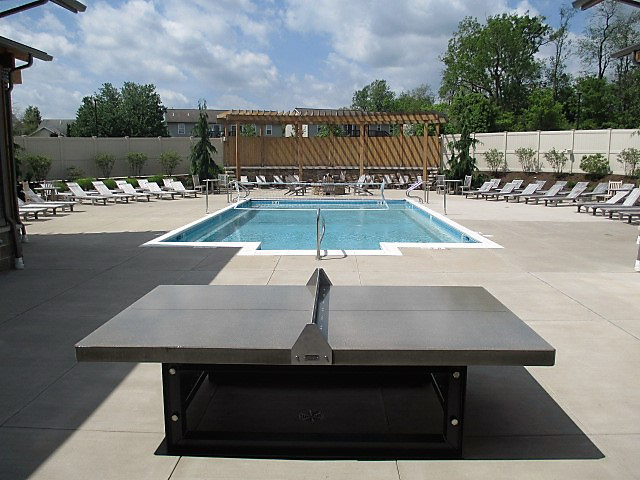 As you can see in the photographs, the ping pong table belongs naturally in this beautiful pool/sun deck area, and it is a great addition to list of amenities that The Heights at State College has to offer it’s residents. 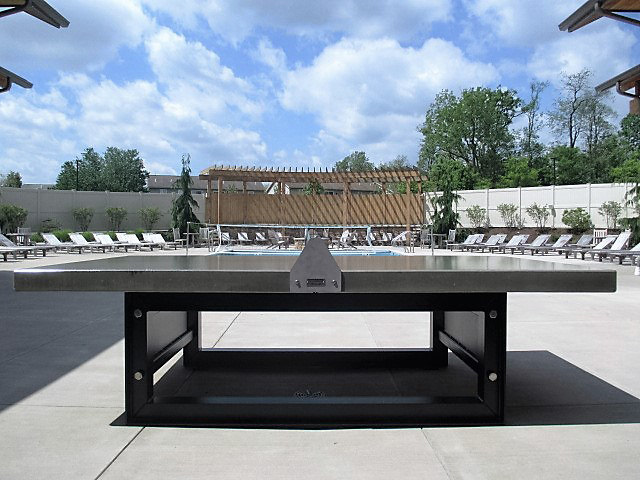 Concrete ping pong table with steel base shown in The Heights at State College pool area. Outdoor ping pong table at The Heights at State College. Concrete ping pong table shown in the background. Looks great in any outdoor setting. 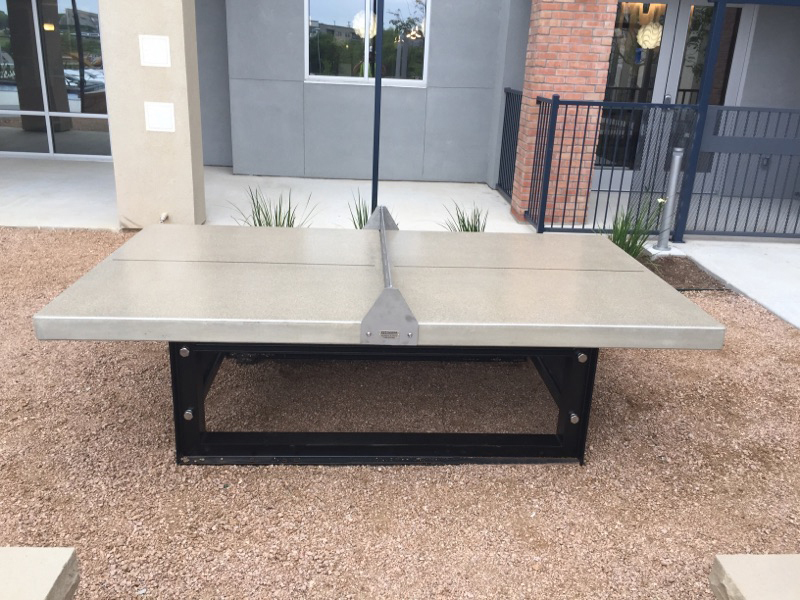 The T1086035 ping pong table looks nice, it is a high-quality, heavy-duty addition to any outdoor recreational area that will last decades. The table features a 4″ thick regulation size table top. This top is 33% thicker than most tables on the market. The top is polished and sealed with two coats of concrete sealer. For added protection, we top coat the table with the best Anti-graffiti sealer on the market: Coval http://covalmolecular.com/products/coval-graffiti/ The outside edges are chamfered to eliminate a sharp edge. Another feature that sets this table apart from others is the heavy-duty stainless steel net. The net is 1/4″ thick and 10″ tall. 4″ are sandwiched between the table top sections, and 6″ are above, which is regulation height. For added support we add stainless steel gusseted end supports. The net is assembled with stainless steel tamper resistant hardware. The steel base is 72″ X 48″ X 26″ and made with steel I-Beam construction. This is heavy duty! The base is powder coated in a 2-step process. The first coat is a zinc rich base coat. The base is finished coated with your choice of many colors. The frame is assembled with 1″ diameter stainless steel bolts.